When light is passed through an inhomogeneous medium it gets randomly scattered, resulting in a diffused smeared-up light pattern even from the best focused laser beam. This is why we have a hard time seeing through a foggy scene or through a diffusive shower glass. Scattering-induced distortions pose a major limitation in many applications in optics, such as astronomy, microscopy, nanosurgury and optical-trapping. The problem of focusing light through inhomogeneous media is even more challenging when ultrashort (sub-picosecond) pulses are considered, since in addition to the spatial distortions scattering also distorts the pulse shape in time (Fig. 1). Figure 1. Spatiotemporal distortions arise when an ultrashort pulse is passed through a scattering medium such as biological tissues: (a) In free-space focusing the pulse is perfectly focused in both space and time. (b) When focusing through a thick scattering medium the multiple scattering distorts the ultrashort wavefront in both space and time, resulting in a spatiotemporal speckled field. In recent years the challenge of correcting the spatial distortions induced by scattering has been the focus of many works in the fields of adaptive-optics and wavefront-shaping. In these works, computer controlled deformable-mirrors or spatial-light-modulators (SLMs) have been used to adaptively shape the incident light’s wavefront such that the effect of scattering is optimally cancelled. Successful results have been reported in both astronomy  and microscopy [2-4], and have enabled imaging through the turbulent atmosphere, aberrated human eyes, and other turbid samples [2-4]. These demonstrations, however, were only relevant for spatial distortions of quasi-continuous light. In spite of the remarkable achievements in the correction of the spatial distortions, no work to date has addressed the simultaneous correction of the temporal distortions, which become important when ultrashort pulses are employed. Understanding and correcting the spatio-temporal distortions of ultrashort pulses is crucial in applications exploiting nonlinear multiphoton processes, such as multiphoton microscopy, nanosurgury, micromachining and quantum coherent control experiments. In a recent work  we have set off to tackle exactly this question, namely, can one engineer an ultrashort pulse light-field such that it will be focused in both space and time through a scattering medium? In a set of experiments using 100fs long infrared pulses and scattering biological tissues, we have shown that not only this goal is achievable, but also that one can control and correct, in both space and time, scattered ultrashort pulses by employing only spatial control on the incident light wavefront. This surprising result is in contrast to the naïve intuitive view that suggests that to effectively cancel spatial and temporal distortions it is required to control both the spatial and temporal degrees of freedom of the incoming field. The deep reason for this surprising result is that the multiple random scattering couples the spatial and temporal degrees of freedom, by introducing different optical paths for the scattered photons (Fig.2). The result of these multiple random paths is that light entering at different spatial position at the input of a scattering medium result in different temporal waveforms at the output of the sample. Every spatial input point randomly ‘codes’ a highly complicated (but fixed) output temporal function. Thus, by controlling only the input spatial pattern one is able to gain temporal control of the output pulse waveform. In addition, as the random spatiotemporal coding is different for different spatial points at the output, it enables both spatial and temporal control. Figure 2: The mechanism for temporal control using just spatial manipulation of the input field: the multiple optical paths in the random scattering medium couples the spatial degrees of freedom at the input to the spatio-temporal degrees of freedom at the output. The output at any position within the medium is a random superposition of contributions from different points on the input surface. In our experiments  we use a spatial light modulator (SLM) to control these different contributions such that they will form a focused ultrashort pulse which is nearly transform limited (TL) at the output. In our experimental demonstration , we have used a liquid-crystal based SLM to control the femtosecond light field, and a two-photon nonlinear fluorescence screen to characterize the spatiotemporal focus behind the medium (Fig.3). The choice of nonlinear two-photon fluorescence (2PF) for pulse characterization is derived from the fact that direct temporal measurement of ultrashort pulses is not possible. Such sub picoseconds pulses are shorter than any temporal response of even the fastest detector. Therefore, for temporal characterization one has to use a physical effect which has a shorter timescale than the pulse duration, in the same sense that a fast shutter or an abrupt flash is used in fast photography. 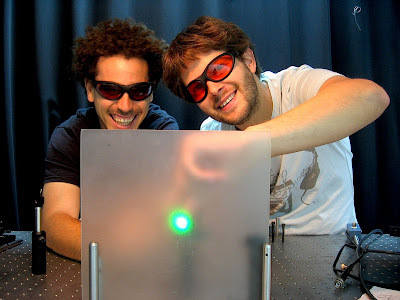 We have chosen to use two-photon optical nonlinearity, which has a sub-10fs timescale as our fast ‘shutter’, enabling the optimization and characterization of the spatiotemporal focus. 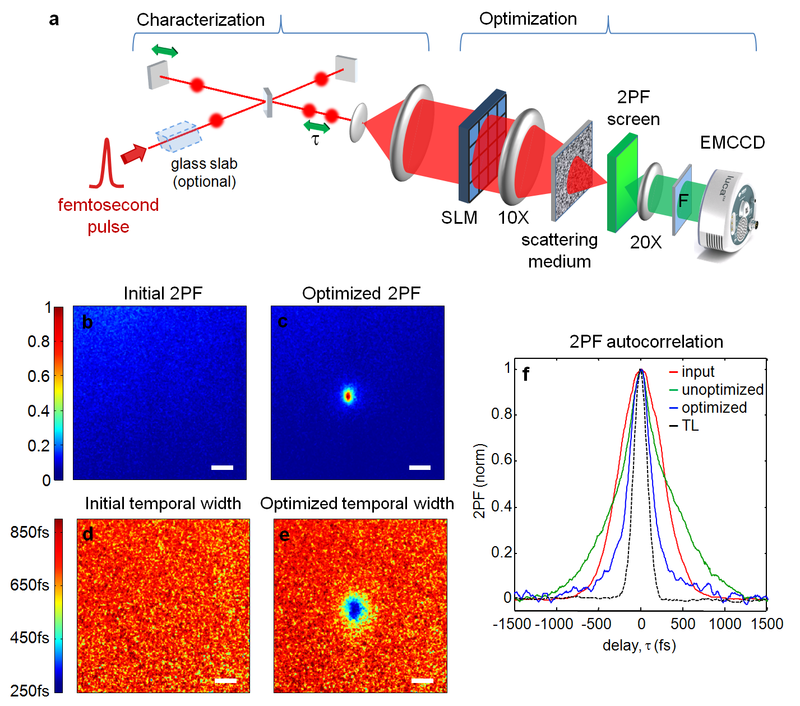 Our experimental setup is presented in Fig.3a: We have used a phase-only 2-D SLM to optimize a nonlinear 2PF signal at a selected point behind the scattering sample. To characterize the distorted and corrected light fields we have utilized a Michelson interferometer to measure the entire field two-photon temporal autocorrelation. A summary of our results is presented in Fig. 3b-f. They show that optimizing a nonlinear 2PF signal using only the spatial degrees of control results in a refocused pulse in both space and time. Furthermore, we used the random scattering to temporally compress pre-chirped pulses, resulting in an output pulse which is shorter than the input pulse (Fig. 3f). The physics behind the spatio-temporal control is closely related to time-reversal techniques, which have been employed in the fields of acoustics and RF electromagnetic waves . Using our scheme, we have successfully demonstrated the spatiotemporal focusing of 100fs pulses through highly scattering biological samples, including animal bones and brain tissue. 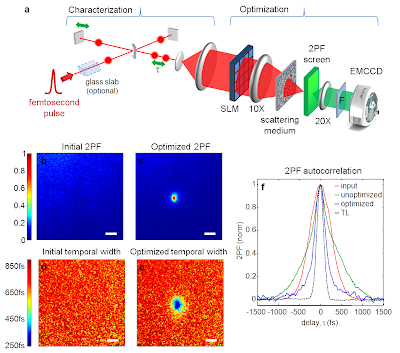 Our results open up new possibilities for optical manipulation and nonlinear imaging in scattering media, a challenge with exciting biomedical and engineering implications. Figure 3: Experimental setup and results of spatiotemporal focusing and pulse compression through scattering media ; (a) the experimental setup; an ultrashort pulse is focused to a two-photon fluorescence (2PF) screen placed behind a scattering medium. An SLM controls the incident wavefront, optimizing the 2PF at a selected point imaged by an EMCCD, (F-band-pass filter). For spatiotemporal characterization we used a Michelson interferometer to measure the temporal autocorrelation on the entire field simultaneously by imaging the 2PF at different delays, τ. To demonstrate temporal compression through the scattering medium we pre-chirped the pulse by a thick glass-slab. (b-c) measured 2PF images before (b) and after (c) optimization showing spatial re-focusing. (d-e) Maps of the measured temporal 1/e-width of the spatially resolved autocorrelation, before (d) and after (e) optimization, revealing the temporal pulse compression around the optimization point. (f) Measured autocorrelations of the chirped input pulse (red, 1/e-width=715fs), the non-optimized scattered pulse (green, 1/e-width=875fs), the optimized pulse (blue, 1/e-width=370fs), and the transform-limited pulse (dashed-black, 1/e-width=230fs); scale-bars, 25 μm. R.K. Tyson, "Principles of adaptive optics", Edn. 2nd. (Academic Press, Boston; 1998). M.J. Booth, "Adaptive optics in microscopy", Phil.Trans. R. Soc. A 365, 2829–2843 (2007). Abstract. I.M. Vellekoop, A.P. Mosk, “Focusing coherent light through opaque strongly scattering media,” Opt. Lett. 32, 2309–2311 (2007). Abstract. I.M. Vellekoop, C.M. Aegerter, "Scattered light fluorescence microscopy: imaging through turbid layers", Opt. Lett. 35, 1245–1247 (2010). Abstract. O.Katz, E.Small, Y.Bromberg, Y.Silberberg, “Focusing and compression of ultrashort pulses through scattering media,” Nature Photonics doi:10.1038/nphoton.2011.72 (2011). Abstract. M. Fink, "Time Reversed Acoustics", Physics Today 50, 34-40 (1997). Nice work, will be very relevant for imaging through complex media such as skin and tissue.